They’ve leveled a criticism at Israel’s new nation-state law that neither the right’s earnest patriotism nor the left’s moral anxiety seems equipped to answer. 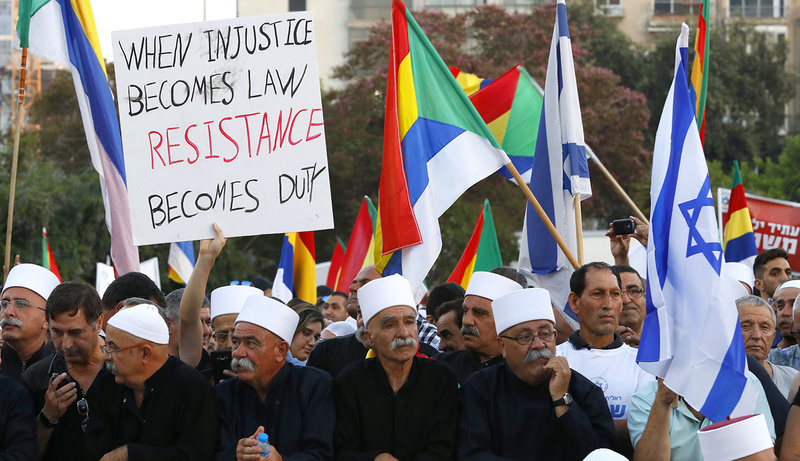 Israeli Druze men protest against the new nation-state law on August 4, 2018 in Tel Aviv. Amir Levy/Getty Images. There is much that is true and important in Moshe Koppel and Eugene Kontorovich’s defense in Mosaic of Israel’s new Basic Law: Israel as the Nation-State of the Jewish People. 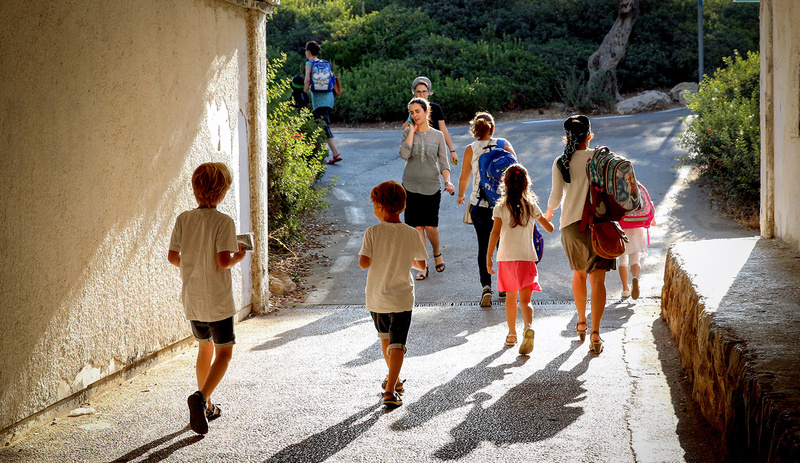 The law, passed by the Knesset on July 19, articulates concepts of identity and nationhood that are fundamental and agreed-upon among nearly all Israeli Jews. Vociferous critics of the law, with their cries about the “death of Israeli democracy,” have struggled to make a substantive case for what the law will change in practice. But in the end it changes little. In a country without a formal constitution, it is a law, like other Basic Laws, of the sort that does not so much affect the day-to-day business of individuals or even the state as it is meant to sway the decisions of Israel’s judges, and especially the justices of the Supreme Court. Even in that realm, its effect might be minimal. Expressing their hope that “some judges will . . . have the integrity to take the law seriously,” the authors frankly acknowledge that others, “unsympathetic to manifestations of nationalism[,] will have little difficulty finding the interpretive tools to construe the new Basic Law in a way that allows them to reach precisely the same conclusions they would reach in its absence.” That is, the law only provides a constitutional anchor for those judges who are already predisposed to rule in favor of “manifestations of nationalism” or are otherwise open to persuasion. In this respect, Koppel and Kontorovich’s essay joins company with a larger effort to explain and defend the nation-state law after the bruising it sustained in the immediate aftermath of its passage. As part of that same effort, the Kohelet Forum, with which the authors are affiliated, published a page-one foldout advertisement in Haaretz containing the law’s full text, in the hope that the newspaper’s left-leaning readership would take the time to acquaint itself with its actual substance. The half-spoken message behind this campaign is that there are no Zionist grounds on which to oppose the law, and that those who say otherwise either have misunderstood it or are motivated by their opposition to Jewish nationalism altogether. To a great many critics of the law, this is indeed a perfectly valid retort. But not to all of them. One group that did not misunderstand the law, either accidentally or deliberately, was Israel’s Druze community. 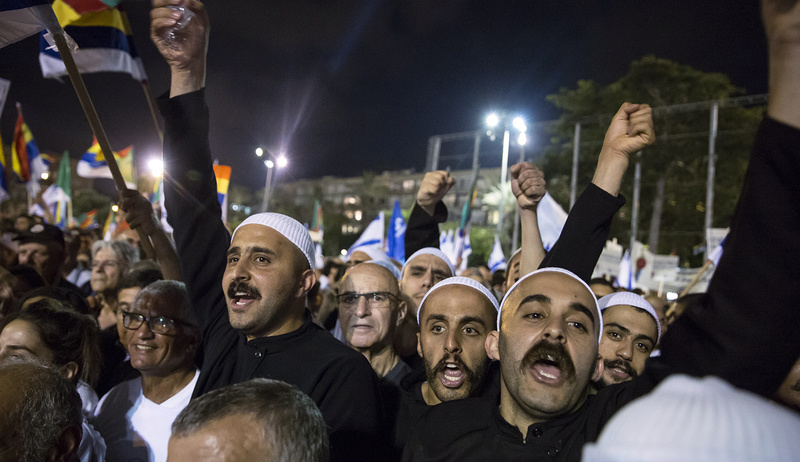 The Druze occupy a special place in the Israeli psyche. They are the non-Jewish, non-Islamic, Arabic-speaking comrades-in-arms who are loyal to the state, who often espouse conservative or right-wing views, and whose service in Israel’s military and sacrifices for Israel’s security grant them pride of place in the country’s civic religion. 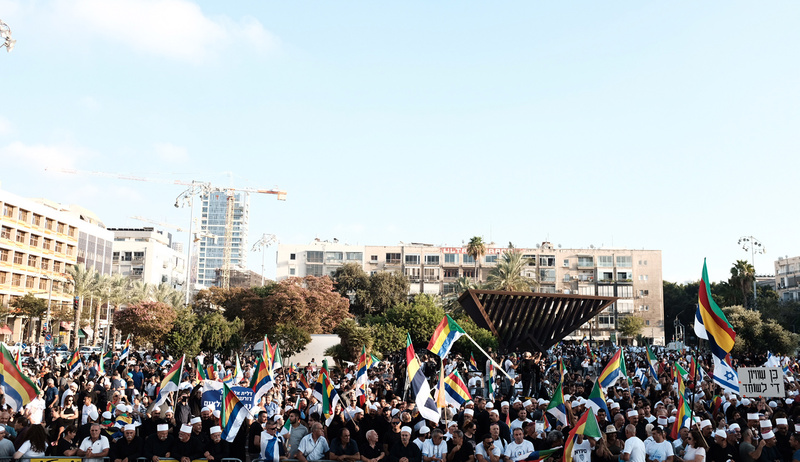 In August, the Druze uproar against the new nation-state law took both Jews and Arabs by surprise, growing so quickly in scale and vehemence as to drown out the protests of Israel’s Arab minority and even the clamorous virtue-signaling of the Jewish left. Those protesting included the community’s top leaders, its young activists, and large numbers of its military veterans, from the most junior reservists to ex-generals. 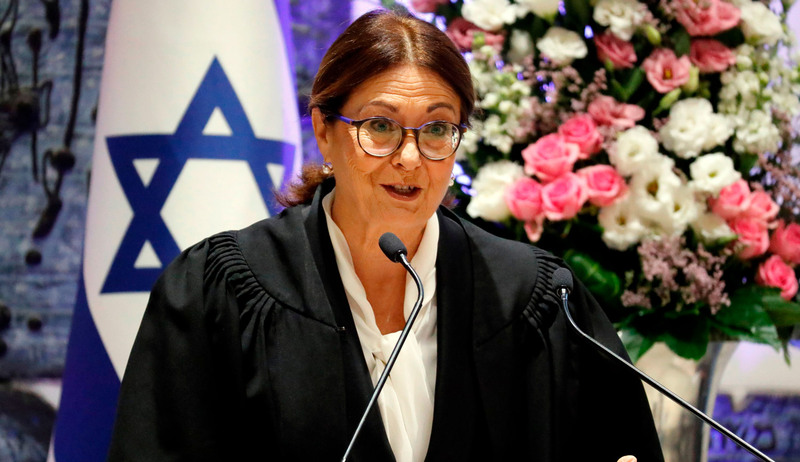 Their fury at the law’s alleged “racism” and “exclusion” could not be summarily dismissed as stemming either from “Palestinian nationalism” or from “anti-Semitism,” as some right-wing Jewish politicians did with the complaints about the law voiced by Israeli Arabs. violates your rights as equal citizens of the state of Israel, and nothing prejudices the special status of the Druze community in Israel. The Jewish people, and I among them, love and cherish you. We greatly value our partnership and our alliance. Underlining Israel’s sincerity, Netanyahu announced the immediate establishment of “a special ministerial committee that will advance this relationship and this commitment.” Adding meat to these statements, Likud leaders soon specified that, since the actual hurt was rooted in economic conditions, these would now be corrected by a generous new package of government benefits to Druze towns, and especially to Druze veterans. But to all this talk, the response of many Druze Israelis, including prominent members of Likud and former IDF generals, was if anything even more outraged. And that response sheds a great deal of light on a deeper criticism of the law, a criticism that neither the right’s earnest patriotism nor the left’s moral anxiety seems equipped to answer. It is here where not just the law itself but Israeli political discourse will ultimately be tested. In their rush to explain away Druze anger, right-wing Jewish leaders had ended up delivering the message that the Druze had purchased Israeli tolerance and funding with the blood of their fallen sons. This was a message more galling than the original law: an explicit statement that the Jews saw their relationship with the Druze as a contractual one and that the lives of Druze children were part of the transaction. And here we come to something vital about Israel’s character and democratic life that is often lost in debates: namely, that many of the most important institutions and freedoms that shape Israelis’ lives are informal. They exist not in law but in a broad and usually vague societal consensus. 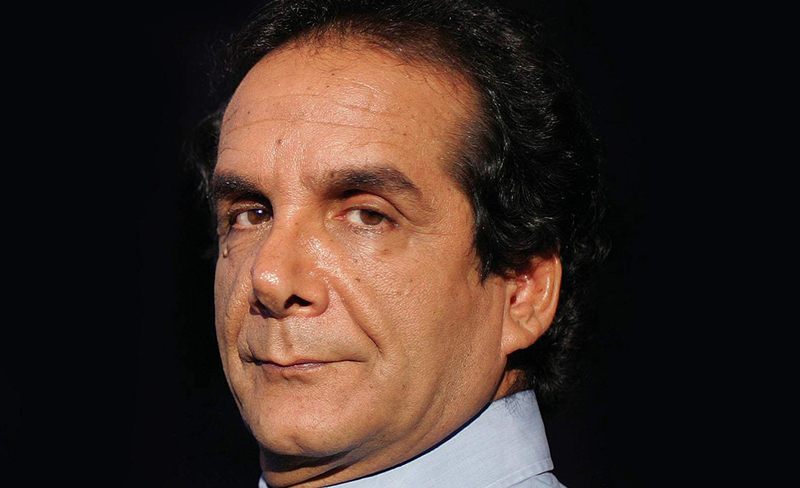 Thus, Israel has an entirely free press, personal religious freedom (even as religiosity is officially controlled and circumscribed by state-appointed bureaucracies), freedom to organize and assemble, individual equality before the law in nearly all questions of civil and human rights, and so forth. But rarely do any of these freedoms flow from explicit constitutional protections. They are rooted, rather, in society-wide agreements that skirt the existing law and fill the gaps left by the lack of a written constitution. This is how a remarkably liberal society can exist with explicitly illiberal legal structures like the state’s system of religious courts. This is how gays can win most of the protections of marriage in a legal system that does not even recognize heterosexual civil marriage. This is how Israelis can enjoy free speech through the simple expedient of its being extremely difficult to silence an Israeli. It is in these attributes of Israeli culture, not in formal legal institutions, that Israeli democracy is sustained. When observing or commenting on an Israeli political debate, therefore, it is not enough to grasp the dry legal issues or formal policy questions being discussed. One must drill down into the usually unspoken social realities that are the implicit subtext and, for Israelis conducting the debate, the actual subject. From this perspective, the new nation-state law inhabits two separate realms. As Koppel and Kontorovich explain, it takes its place in a long-running debate over Israel’s constitutional order, and especially over the nature and prerogatives of its powerful judiciary. But informally, and thus possibly more importantly, it is also meant as a “mission statement” (to use their apt phrase). To this demand that the Jews surrender their autonomy, the new nation-state law responds with an explicit declaration of Israel’s uniquely Jewish identity and purpose. While all have access to the same individual rights, only the Jews may claim collective rights of self-determination. Doesn’t it follow, many Druze now ask themselves, that only the Jews can fully and completely identify with the Jewish state? When anthropologists speak of liminal social spaces, they are usually referring to short-lived passages from one social or political condition to another. 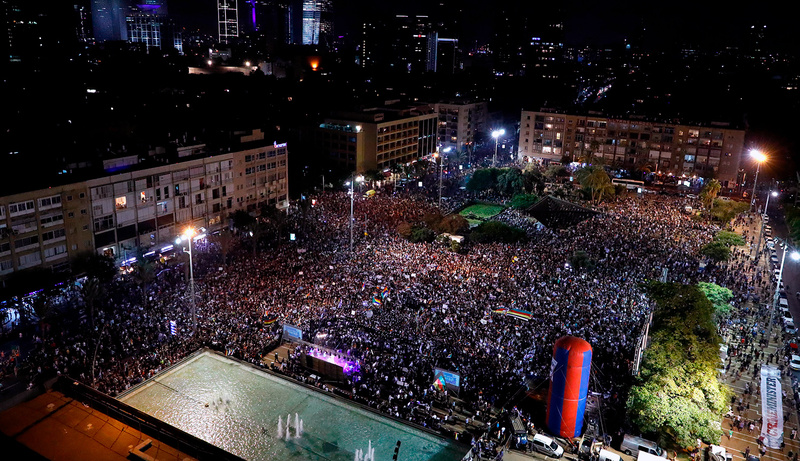 In Israel’s fractured but simultaneously close-knit society, it is within long-lived passages of this kind that Israelis with conflicting visions of their national character have found the space in which to thrive. Ḥaredim, religious nationalists, traditionalists of various sorts, settlers, progressives, secularists, and, in addition to the Jews, Christians and Muslims and all the rest, each bolstered by sectarian political parties and religious courts and distinct education systems—all have relied for their flourishing on the vagueness at the heart of the Israeli civic order. In these undefined areas, the Druze also found their space. As long as Israel wasn’t explicit about what it meant to be Israeli, it was possible to be entirely Druze and, organically and inseparably, entirely Israeli. In the ambiguities permitted by the same lack of clarity, and under the umbrella of a familiar Jewish narrative of self-reliance rooted in past persecution, a minority community found not just safety but kinship. 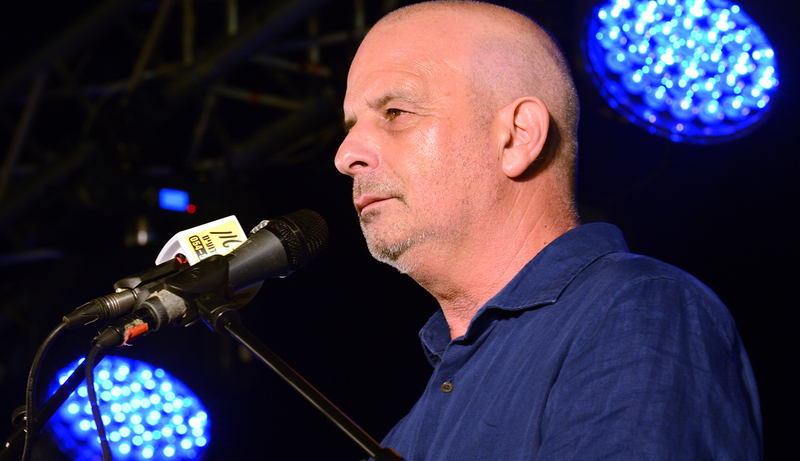 Many are now left wondering what place they have in a country that has decided to define itself in ways that make them, in the words of the retired IDF brigadier general Amal As’ad, “guests” and “servants” of the Jewish story. In the end, the nation-state law will not be measured by how well its defenders can convince us that it is entirely in keeping with democratic norms elsewhere in the world. Its sole importance lies in how it affects the Israelis who must live with it, including those like the Druze who support and fully validate the Jewish narrative espoused by the new law but who have lost something precious that few Druze and no Jews had bothered to articulate beforehand. Plainly, there are real costs for abandoning ambiguity. It is beyond my abilities to determine whether those costs are outweighed by the benefits of clarity and specificity about Israel’s identity. There is certainly a valid argument that they are, and Koppel and Kontorovich get at many of the essential points. Israeli democracy, however, does not spring from the kind of constitutional engineering that gave birth to American liberty, but from a tense social compromise hammered out over decades among disparate political, ethnic, and religious identities. As the Druze have taught us, too much is at stake for the debate to be closed off without more thought than has been brought to bear thus far.